A Popular Sport For Any Body! Images Courtesy of Deborah Dubois Walker • Isle Life • All rights reserved ©2008 Visit the All Links page to review ALL the most current Kauai Activity Vendor Rates and Offerings along with Free Island Info. Two hour Lessons can be scheduled through out the day from 8 am to 4 pm, 7 days a week. Learn to Stand Up Paddle, cruise the rivers, and out into the bay. Explore and enjoy the beauty of Kauai?s lush river valleys. Learn to ride waves and even take a down wind run (advanced). Learning to SUP is fun and easy for all. We will show you a great time! Learn the basics of SUPing in the river and then gain the confidence to head out into the bay to get some rides. 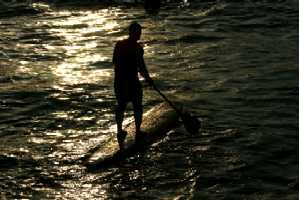 Starting in Hanalei river we teach you how to ride and maneuver the SUP Surfboards. We also instruct you on the best paddle techniques and key tips to maintain balance while SUPing. Then we cruise up the river on a scenic tour taking in all the beauty of Hanalei valley and its waterfalls. 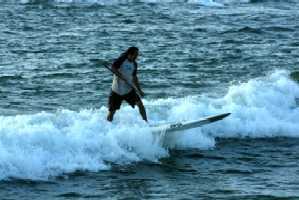 After you get accustomed to the paddle board you have the option to test your balance in the ocean where the waves near the Hanalei River mouth give you more of a challenge. 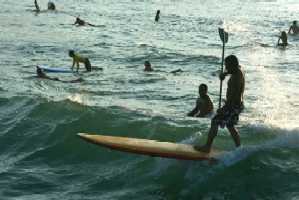 If you pick up SUPing quick, then you can drop in for a few rides near the pier. Learn how to surf, ride waves, and take your SUPing to the next level in the ocean. 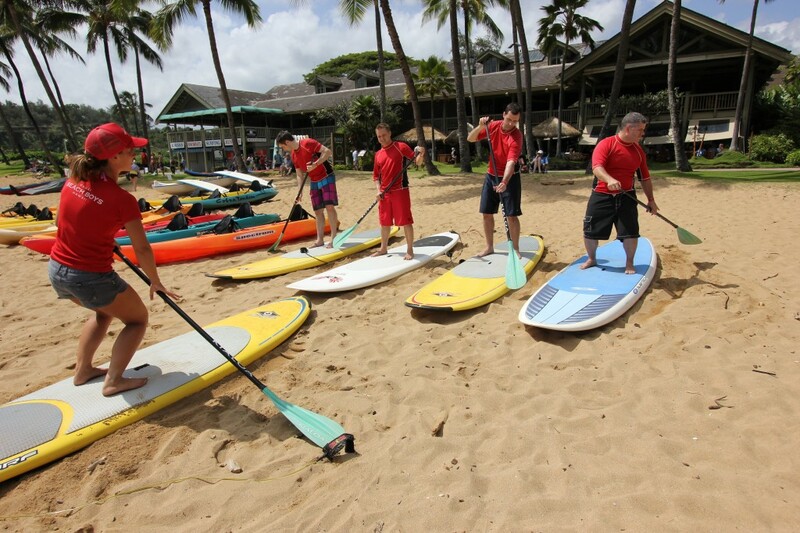 Learn the ins and outs of surfing your Stand Up Paddleboard in the waves of Hanalei Bay. The best way to end your day is on the bay at sunset. Hanalei hosts amazing sunsets and the smooth waters of the bay make for an epic evening paddle. Upon request we?ll even throw in the beverage of your choice to watch the sun go down. All instructors are friendly, insightful, knowledgeable teachers with years of surfing experience as well as First Aid, CPR, and American Red Cross Ocean Lifeguard safety certified. Evan Valiere is a professional surfer from the North Shore of Kauai. As a pro he has accomplished winning the Xcel Pro at Sunset Beach, placing 5th at the Pipeline Masters and has been featured on the covers of Surfer Magazine, Surfing Magazine, FreeSurf Magazine, and Nalu Underground Magazine. 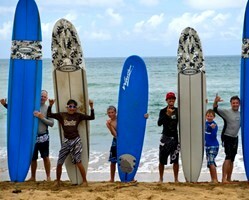 As the owner of Hanalei Surf School Evan enjoys teaching new surfers the joy of riding waves for their first time. Brittney Valverde has been surfing since she was 12 years old, and still loves to ride waves to this day. As a Yoga Alliance certified instructor with 9 plus years of Yoga practice and daily lifestyle drawn to good vibes and good health she’s just the type of host you’ll want to meet on your stay. Her style and grace in and out of the water will be warmly felt during your time with her whether learning to SUP, on the yoga mat, or along the beautiful mountains of Kauai. Born and raised in Hawaii Brittney is a true ambassador of the Aloha Spirit. How about Yoga on a SUP? Roy Powers is a former ASP World Championship Tour surfer who comes from Hanalei, Kauai. Roy has had many career accomplishments including a victory at the Reef Hawaiian Pro during the Vans Triple Crown of Surfing that launched him back onto the World Tour. Roy is a great surfer and it is a great opportunity to be able to learn to surf from Roy! Growing up surfing the North Shore of Kauai with Irons lineage in his family name, Drew is a very talented surfer as well as a friendly and knowledgable surfing teacher. Drew is a laid back guy, but when the waves get big and barreling he is very exciting to watch because of his creativity. Drew also paddled very well last year in the annual Na Pali Race, where he placed 2nd in the competitive Stand Up Paddleboard division during the 17 mile Na Pali Coast course. Jesse is among the young chargers from the North Shore of Kauai, surfing at some of the premier black diamond type waves and other spots along Kauai’s North Shore. Jesse also ventures to the North Shore of Oahu in the winter to surf the worlds most well known and challenging waves of Banzai Pipeline and Sunset Beach. Jake Saylor knows the ins and outs of Kauai like the back of his hand. Friendly knowledgable and a very good instructor he will be sure to show you a great time while you are learning to Surf or Stand Up Paddle. Many of you returning visitors will remember old Kauai Surf Hotel, the first hotel to open on Kauai at KALAPAKI BEACH in the late 1950s ... Since then, the Beach Boys have been teaching visitors and locals how to best enjoy what the ocean has to offer. These are professional water men, accomplished surfers, sailors and canoe handlers who make a living doing what they are best at and who are willing to share their knowledge of the ocean with a true spirit of ALOHA. The bay fronting KALAPAKI BEACH offers some of the safest waters in the State of Hawaii. The conditions here are well suited for a wide array of Water Sports and Activities such as: Surfing, Kayaking, Snorkeling, Sailing and Canoe Paddling. 1.5 hour SUP LESSONS are given daily with up to three classes per day, seasonally. Each lesson is a group lesson of no more than 4 students per instructor (depending on surf conditions). The student spends approximately 30 minutes with the instructor on land and in the water for the remaining hour. Lessons include a land demo, stable boards, rash guards and booties. Kalapaki Beach offers one of Kauai's best beginning surfing locations. Please Inquire about specific times available for when you will be visiting Kauai. Special Note: Plan to book ahead for Mon thru Fri, as Pakala Surf Co. is taking days off on Saturdays and Sundays to allow their community to enjoy some fun too. Mahalo for your kind understanding. C4 Waterman Premium Paddle Boards / Soft & hard top SUPs in a variety of sizes. All Rentals include the board + paddle (SUP) + leash and car straps. All surf lessons include: Top quality paddle board & paddle made by C4 Waterman, leash (if desired), personal instructions on the water PFD (Personal flotation Device) if desired. 24 hour Cancellation Policy applies to ALL reservations. The current time in Hawaii is displayed below, along with the current Kauai temperature. Keeping you SAFE while you are here! 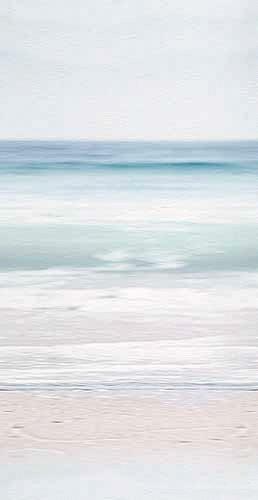 Click on the KBE image Link to go to the most comprehensive Ocean Report for the Garden Island. A Tip for the Novice: Just click the arrow forward or back to return to pages that you want to review again. Note: A few of the direct links to other web sites open a new browser window. You will not need to arrow back to Try Kauai, just close the window when you are done. Mahalo for your kind support all these many years.